My return to Cordoba this Summer was wonderful. Although I´ve been several times before its a place I love to visit over again. This three day break in the city of Cordoba was going to be at the hottest time of the year. So I chose a well located hotel with a swimming pool. Las Casas de la Juderia. 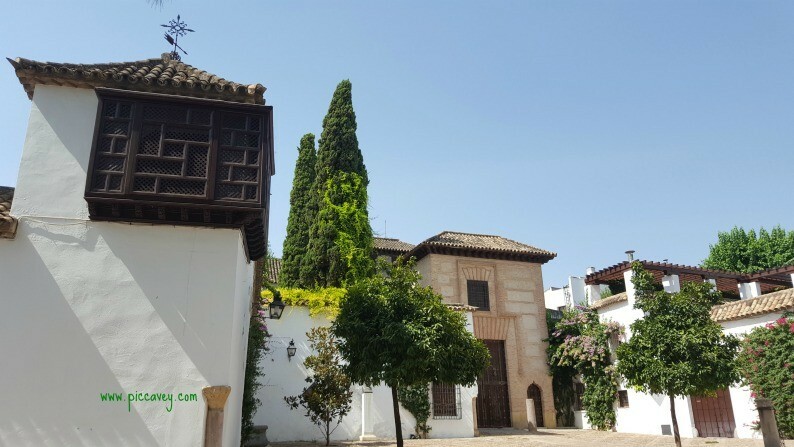 This period building is opposite the Alcazar de los Reyes Cristianos and amongst the streets of the Juderia of Cordoba. Perfectly situated so I wouldn’t have far to walk if I needed a dip in the pool. 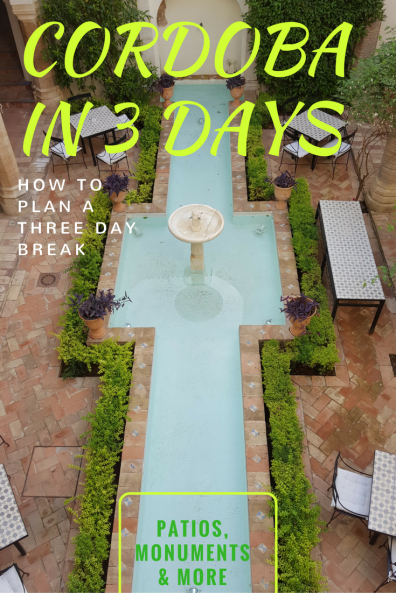 So what did I plan for three days in Cordoba? Here´s my itinerary so that you don´t have to workout the timings again. I would recommend that as soon as you reach Cordoba that you get an updated timetable of the monuments and museums from Tourist Information. Although I have put the details here they do change according to season and restoration works. The Tourist Information office is next to the Roman Bridge. Set inside a modern glass Building on one side of the grand archway. Here they sell tickets for the Medina Azahara bus and will help with any questions. The stunning gardens of this fortress will stay in your mind long after you visit. 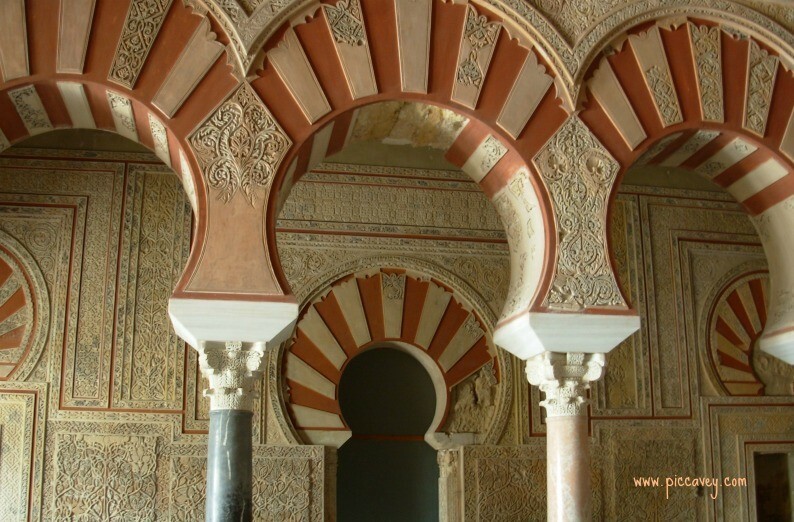 This is one of three UNESCO World Heritage sites on this Cordoba itinerary. 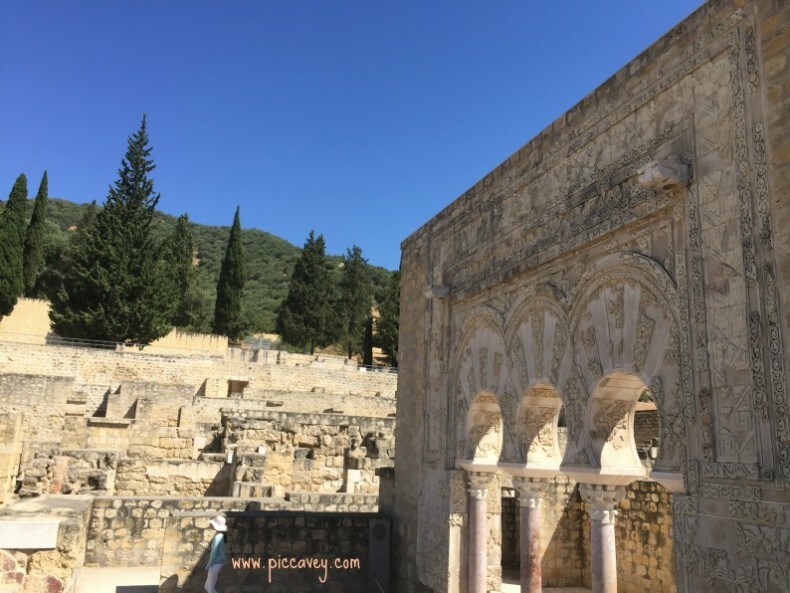 This site was once the location of the Caliph´s palace but when the Christian monarchs won the city of Cordoba they used this as their royal residence. It was also the courts of the Holy offices and later used as a prison too. There are statues of the relevant monarchs at the time which are set along a grand walkway through the gardens. Plan your visit according to the opening times. They only open in the mornings from 8.30am until 3pm. If you want to avoid the heat go when they open first thing. As much of the visit is outside best to avoid the midday heat. Depending on how many photos you take and your interest in the history and architecture of this site I would expect around 2 hours for your visit. 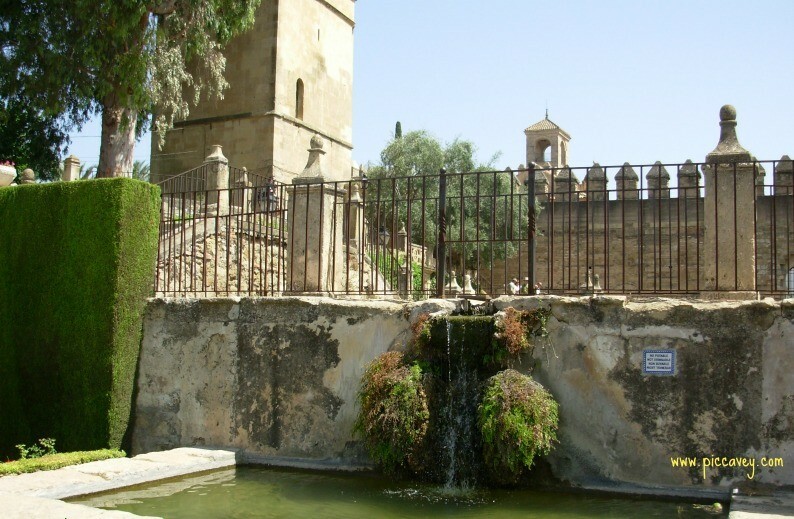 After visiting the Alcazar, find the Caliphs bathhouse opposite in the gardens. This doesn´t close until 3pm so you should have time to pop in before lunchtime. These baths would have been the largest in Cordoba at the time. The building date back to 11th -12th centuries.. Only some of its surface area can be visited, they were actually bigger than the space we see today. 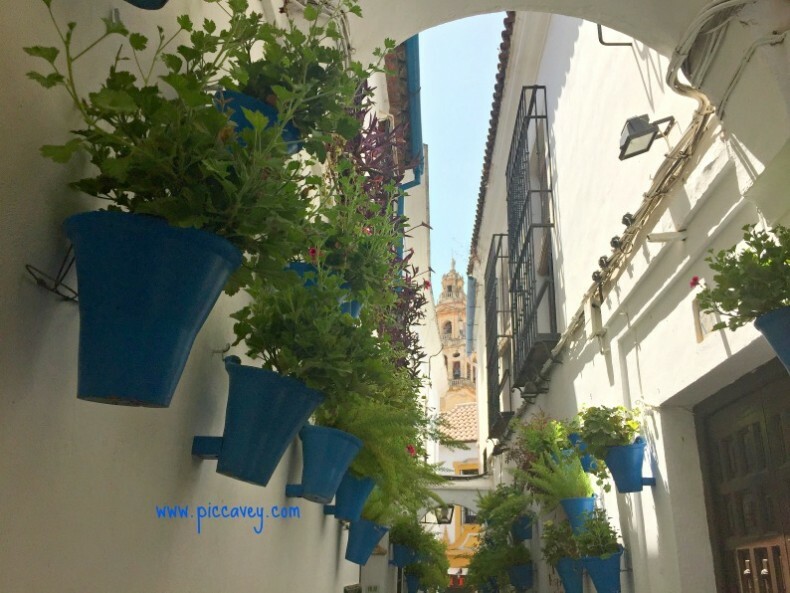 Before you pop into the Mezquita look at the Callejon de las Flores which is opposite . This busy street is popular as you have a perspective from a small square to the Belltower of the Cathderal. Visiting the Mezquita Cathedral is the main draw for many visitors to Cordoba. Open both mornings and afternoons I would recommend visiting this in the afternoon. Many monuments are only open in Cordoba from 10-2pm so it is best to plan to make the most of those which can be seen in the afternoon. Dating back from 784 A.D this huge building boasts an enormous prayer hall with its distinctive columns which see infinite as your eyes look inside. This was extended three times during the Caliphate as the population of Cordoba grew. In the 10th century Cordoba was the largest economic and cultural city in the western world. At that time the three cultures lived together in the city, Christian, Jews and Muslims. This site centuries before the Cordoba Caliphate had a Visigoth place of worship called St Vincents Church. Around the year 500 when they were a dominant power in the Iberian Peninsula. So this site has been religious for as long as we have records. Inside the Mezquita Cathedral in the 17th century a grand altar and cathedral was built at the centre of the building which is why is it known as the Cathedral of Cordoba rather than the Mosque. Most guides and signs name it as Mezquita Cathedral. There is a night tour which is just one hour but I prefer the full tour in the daytime as you see the building in more detail. I wrote this guide from a previous visit. 6 restaurants to try in Cordoba with some new discoveries from this recent visit. Typical dishes are Fried Aubergines in honey, the Flamenquin fried dish and for meat lovers dishes made from Oxtail. Local wines such a Montilla Moriles are worth tasting while you are there too. 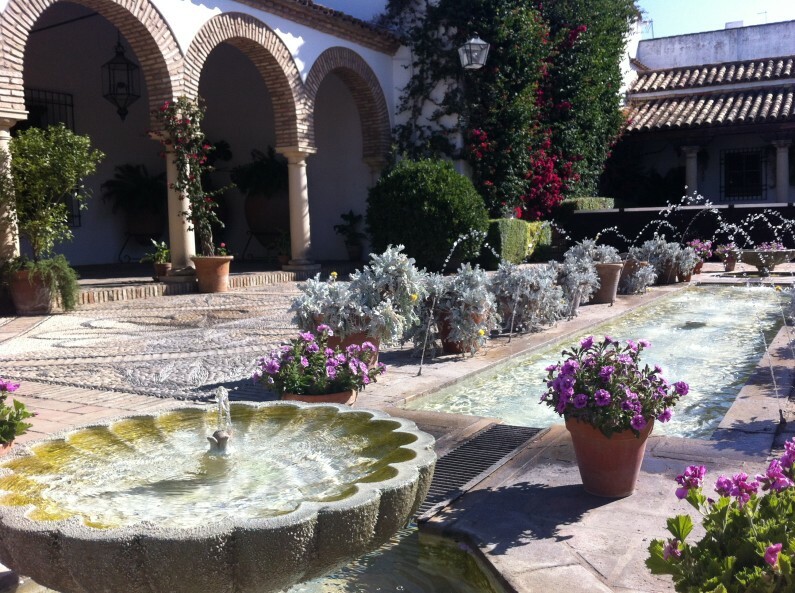 The patios of Cordoba are well known and they are not located on only one area. Find them in some private hotels and homes. In the Barrio del Alcazar Viejo and also at the Palacio de Viana. This stunning 16th century building has twelve patios. Almost more gardens than building. I visited this on my previous trip. 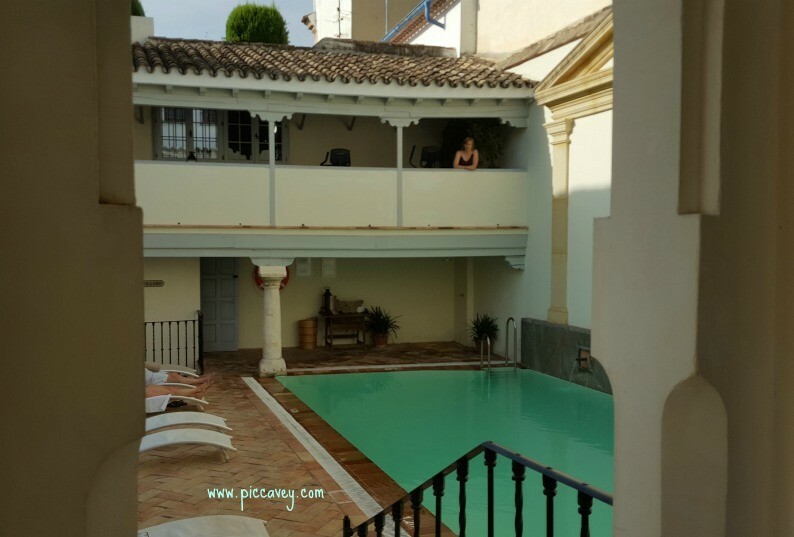 Once you have seen the Palacio de Viana head to the group of Patios known as the Patios del Alcazar Viejo. These are people’s homes with colourful patios inside. You get a ticket to visit all of them and pop in and out of the different houses along the street until you have seen them all. The opening times vary according to the time of year. When the Patios festival is on in May it does get very busy and there are long queues. Opposite the Synagogue is the Sephardic house which is open from 10am to 6pm. 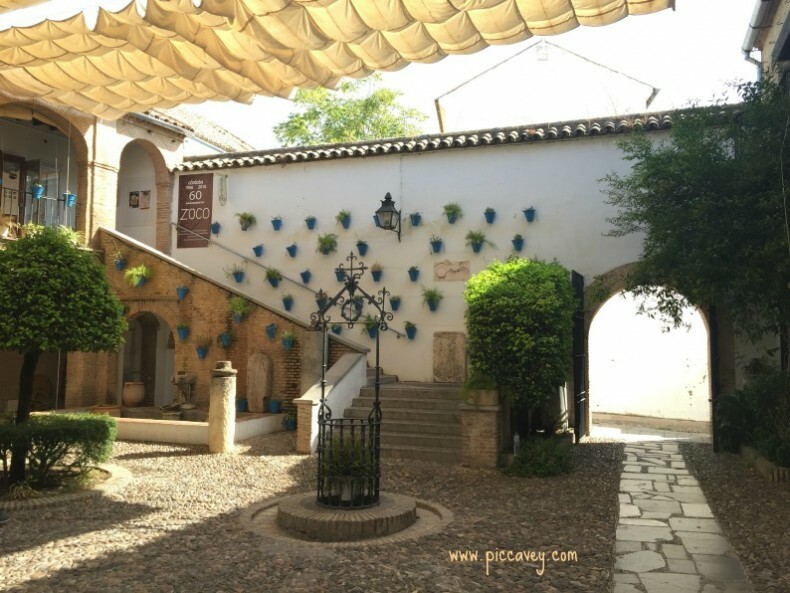 This 14th Century house has five rooms which explain the history of the Jewish community in Cordoba. Allow 30 mins to 45 mins for the visit. Nearby on Calle Judios is the Casa Andalusi. 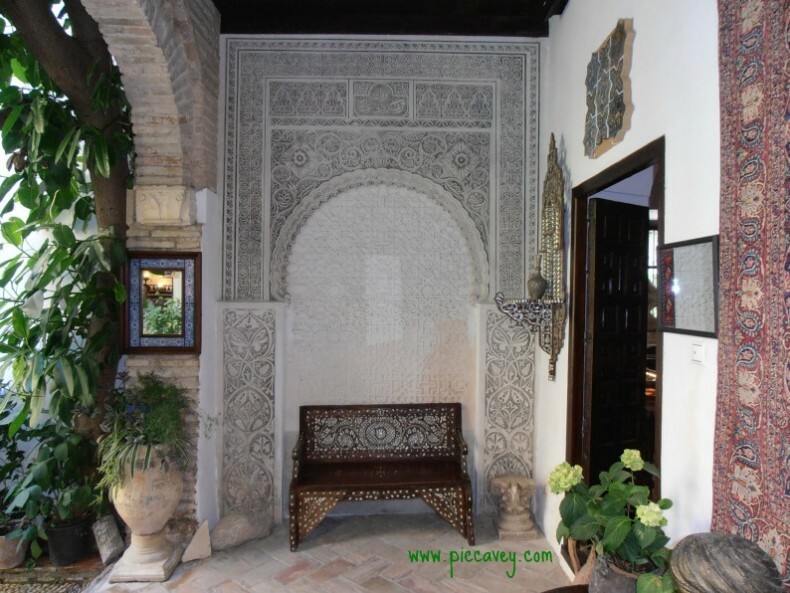 A home recreated to give you the feel of a house at the time of Al Andalus. Open from 10am to 7pm they also have a paper museum inside with the history of the production of the scrolls at the time of the Caliphate. An open air market in the Juderia which is open from 10am to 8pm. Find charming artisan stalls selling handmade goods such as leather and silverware. 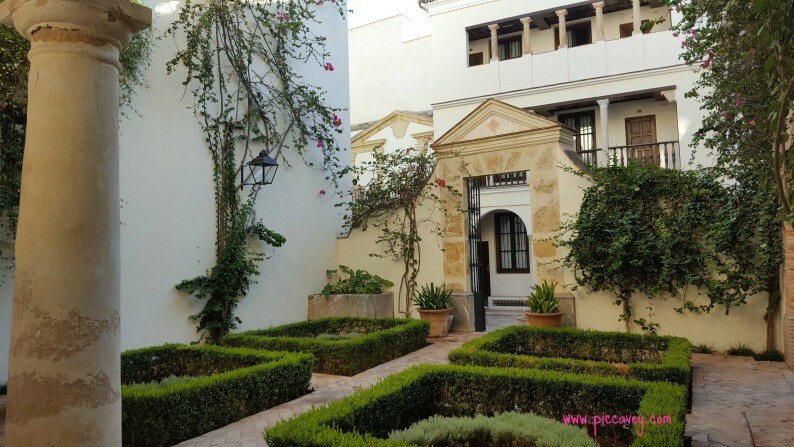 A charming patio with an old well is at the entrance and the courtyard is lined with plantpots too. The Royal Stables have shows on three times a week. 15 euros per person. The stables are free to go into although there isn´t much to see as the horses are now on public view. Head over to the Caballerizas to buy tickets here ahead of the show. trance and the courtyard is lined with plantpots too. The show is called Flamenco and Passion in Cordoba, it last 90 minutes and ticket includes one drink per person. In an absolutely stunning histoical setting, this is a great way to get the essence of Andalusia during tyour stay in Cordoba. The real reason for my return to Cordoba was to visit the Medina Azahara. This monument was declared UNESCO World Heritage site recently and I hadn´t visited it since I moved to Andalucia ten years ago. Medina Azahara is an archaeological site a short drive out of the city on the surrounding hills. 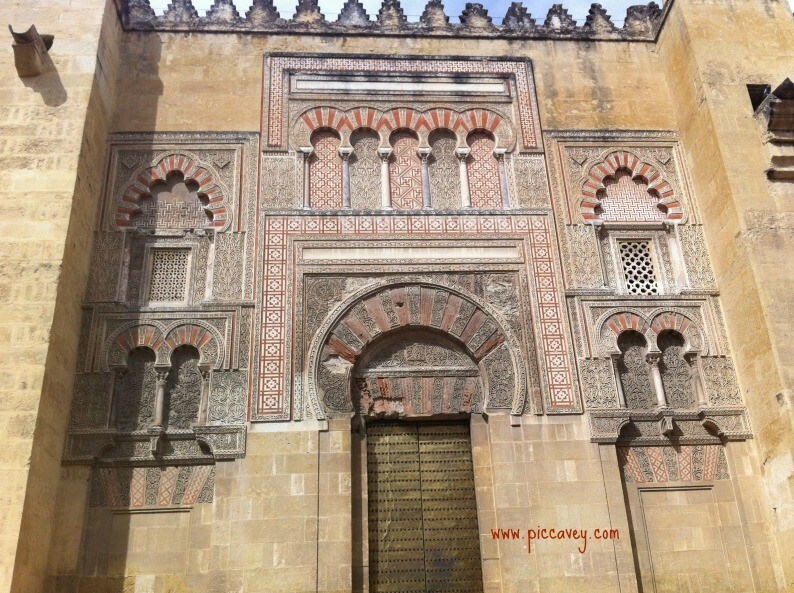 A palatial city built in 936-940 this was built by the Caliph of Cordoba as a symbol of power. This space had aristocratic residences, bath houses, administrative buildings, large garden spaces and a ceremonial mosque. Only 10% of the area has been excavated and restored, it´s the main area of the city. But with 112 hectares of land in total there still could be some surprises undiscovered. I booked my bus tickets at tourist information office. The bus leaves from Glorieta Cruz Roja, a roundabout just below the Paseo de la Victoria. The bus picks up and drops off at this point. It takes you to the Medina Azahara which is free to go inside. If you want a guided tour usually there are tour guides on the bus or at the bus stop offering their tour. The air conditioning at the hotel worked well. Another nice touch were the jugs of iced water with lemon and grapefruit slices at the entrance. Most welcome on hot days when you get back. 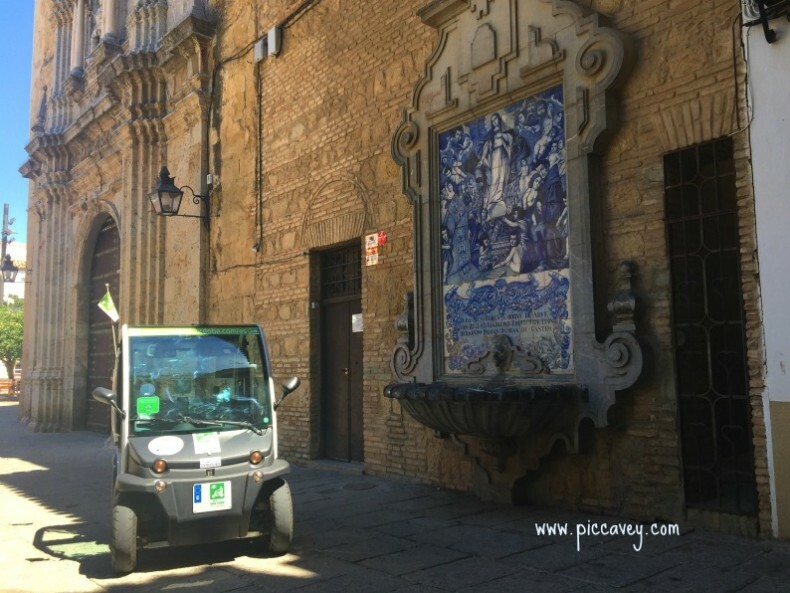 If all this walking around seems too much I also discovered Ecotour Cordoba a company providing buggies and trikes in Cordoba. This way you can visit without having to walk all day. This is a good option for hot days or if you have little time in the city. 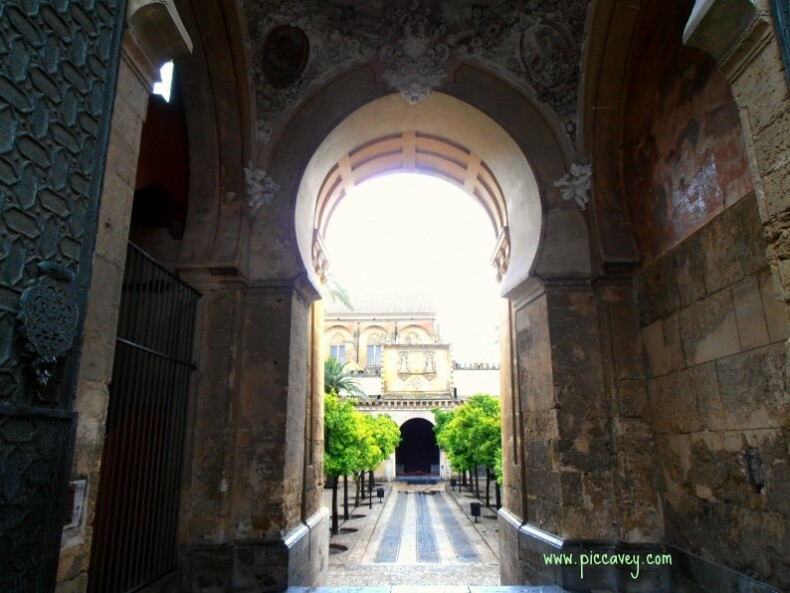 Have you visited Cordoba Spain ? What was your highlight? I missed Cordoba this time around. I definitely have to go again to Spain just to see Andalusia. Such pretty pictures. great post! next time i’ll be in Cordoba i will follow your tips! What a great guide, with such an extensive list! I definitely need to return to Cordoba… I visited around 5 years ago but it was just on a day trip so I didn’t see a lot on your list. Now I know there is so much more to see, thanks for sharing all of your tips! I have only been to Barcelona ! Looks stunning!! !